Recently I heard something quaint from someone who’s not from The South: “I thought you guys had just two seasons – warm and hot!” Bless his little heart, y’all. 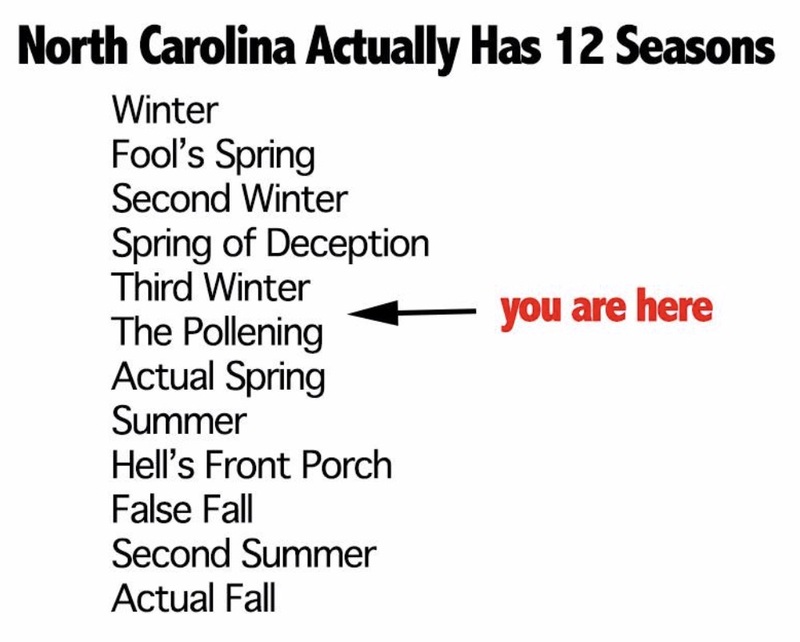 Down here, we have twelve seasons at the very least, and most occur in the middle of ‘spring.’ Don’t get me wrong. I rejoice when I know it’s spring again. I’m all too quick to toss my winter sweaters and heavy coat into storage bins and break out the beach gear. But then winter whips right back, and no meteorologist can clarify what exactly is going on. As the locals know, you’re best off sticking your arm out the window and then again a few hours later. Spring doesn’t just arrive down south – it comes and goes over and over again until, all of a sudden, it’s hot as Hades and then you know: it’s summer. When springtime comes our way, sunny days are followed by freezing ones. Beautiful bursts of dogwood, azalea, and daffodil blooms show their pretty faces just a day or two before they’re blasted with surprise frost or even snowfall. And then comes the ‘other’ snow: bright yellow pollen dust. Already, my allergies are in full swing. 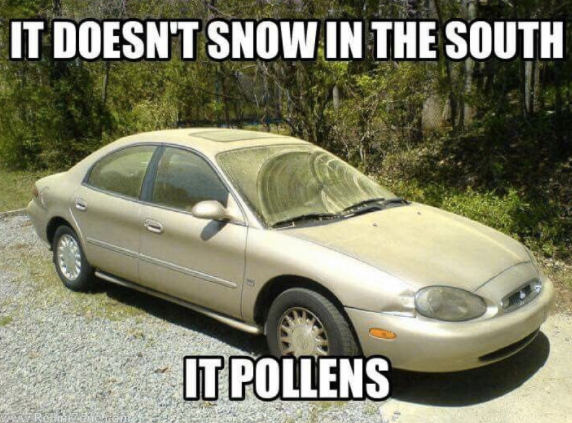 It doesn’t help that the southeast is literally the hay fever capital of the USA – just ask the Asthma and Allergy Foundation of America. As it turns out, our warm, balmy days combined with our gorgeous variety of trees create the perfect storm of a nearly never-ending pollen season. With an itchy nose, way too many sneezes, and red, watery eyes, I’m wondering if this is the worst year yet. The experts recommend I keep all of my windows closed, wear sunglasses outside, and cover my hair with a hat. Then, every time I come back home, I’m advised to remove my shoes, wipe my pets off with a towel, take a shower, shampoo my hair, and change and wash whatever clothes I was wearing. So, I’m considering a HAZMAT suit. According to Amazon reviewers, this one is ‘practical and fun.’ And it’s yellow – the color of spring! What are you doing to survive this spring? Perhaps a nice cruise somewhere far, far away from trees?